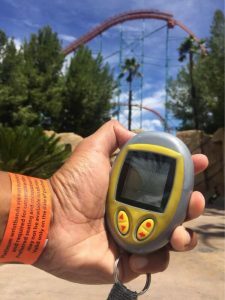 Is Six Flags Flash Pass Really Worth It? Long lines are the enemy of coaster fanatics everywhere. So, it’s no wonder that Six Flags has capitalized on the impatient among us with the Flash Pass. Is it really worth it though? It’s the most commonly asked question we get from visitors to Six Flags parks. Considering the arm and a leg Six Flags demands for the benefit of skipping its sometimes insanely-long lines, it’s a tough sell for many guests. “Skip the lines” tickets and passes have become wildly popular at theme parks across the country. Six Flags’ virtual ride reservation system is touted as an effective way to make the most out of your visit, freeing you from the agony of waiting. So, what’s the catch? At anywhere from $30 to a whopping $145 per person (depending on when you go), the prices alone are enough to make your stomach churn more than the rides themselves. Not to mention that park admission is not included with Flash Pass. REGULAR ($30-$50) – Just reserves your place in line. You wait as long as everyone else, but not in the actual line. GOLD ($45-$90) – Reduces your wait time by 50%. We recommend at least Gold. PLATINUM ($70-$145) – Instant front of the line access–practically no waiting. Plus, ride twice in a row on select rides. Here’s the Platinum Flash Pass in action on a crowded summer day at Six Flags Great America. A 3-hour wait for Goliath turns into less than a minute of walking straight to the front of the line. Pretty nifty! Here’s the bottom line: Whether Flash Pass is worth buying or not largely depends on what day you’re visiting the park. We recommend Flash Pass on historically crowded days. Check out your Six Flags park’s Crowd Calendar forecast to find out which days Flash Pass is a good idea and when you should probably just save your money. Generally, if you’re going to Six Flags during the off-season, like in May, the end of August, or September, it may not be worth it at all. It’s simply hard to justify dropping cash on Flash Passes to skip a 5-10 minute line. In fact, Six Flags parks are virtually empty some days of the year (we call those “Ghost Town” days), with walk-ons to many rides. Go to Six Flags during the summer season, however, and that pricey Flash Pass can be a lifesaver. It ends up being almost a necessity on days when wait times stretch to 1-2 hours. Keep in mind that you can always wait until you arrive at Six Flags to assess how bad the lines are and purchase Flash Passes inside the park if needed. We don’t recommend doing this on days that are very likely to be crowded though (like on holidays or a “Forget About It” day), as there will be a long line at the Flash Pass Center and passes may sell out. What do you think about the Six Flags Flash Pass? Is it worth it? What has your experience with Flash Pass been like? Let us know in the comments below! Great post! I see people buy Flash Passes all the time on a day when the park is empty and there’s no lines to anything. Such a waste of money! Gold is the best value by far! On a day when lines are 1-2 hours, every line is cut to 15-30 minutes. You will get A LOT done. The Regular Flash Pass will only help you get on a couple rides on a crowded day. You still have to wait hours in other lines. Not really worth it. Platinum is only good for people who want to ride multiple times. Otherwise, it’s not worth it since you’re basically just paying more to skip the people who have Gold. Can you use the gold more than once on the same ride? Thanks for this! The calendars help a lot. We usually go to the park early to see how bad parking is and the lines are outside at the entrance/ticket booths. If it’s empty, you probably won’t need Flash Pass. Around July to August is when it’s most crowded and the Flash Pass is pretty much a necessity to get all the rides in. I agree 100%. Gold is the way to go! Cuts the lines down if you go on a really crowded day. Platinum is overkill for most people I think. Here’s another tip to save some money. If you have a large party and don’t mind riding separately, you can buy 1 or 2 Flash Passes and take turns sharing them. We love the Platinum Flash Pass. I figure if I’m going to spend that kind of money to skip the lines, I might as well ride twice in a row. You should only get Platinum if you really love roller coasters or don’t want to wait in lines at all. Otherwise, I think most people will be okay with Gold. The Flash Pass can be a ripoff if you go on an empty day. It’s a shame Six Flags still sells them at the front gate on days when there’s no lines for anything. The park could be completely empty, but I see people still buying them. There’s also no refunds if you buy Flash Passes in advance online and you end up not having to use it at all. We never buy the Flash Pass when we go to Six Flags. It’s way too expensive! Just go during the off-season, arrive when the park opens, and the lines shouldn’t be too bad at all.